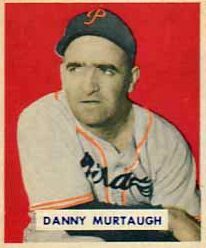 Danny Murtaugh, a Chester native, played on the Phillies from 1941-1943 and again in 1946, then finished his career in Pittsburgh in 1951. He was a decent but not great player who batted .254 for his career. In 1942, he ended the season on a low, finishing the year 0-25. In 1943, he picked up right where he left off, going 0 for his first 11. Finally, in the 4th game of the 1943 season, he broke through with a hit. Murtaugh would go on to manage the Pirates, leading them to World Series wins in 1960 and again in 1971. Len Matuszek put up some of the worst numbers in Phillies history in the 1982 season. He ended the season with an .077 batting average, 0 HRs, and 3 RBIs. Used mostly as a pinch hitter, he collected his last hit on April 18th, going 0-24 over the rest of the season (but, incredibly, he was still used as a pinch hitter through September.) The Phils finished 89-73 that year, but 6-19 in games in which Matuszek appeared. He kept right on sucking in 1983, going 0-5 in APril before being sent down to the minors. He came back up in September, went 0-7, then finally got a hit on September 11, 1983. It had been almost a year and a half since his last hit. He would replace Pete Rose at first base the next year, then be traded to the Blue Jays in 1985. Desi Relaford was a all-glove, no-hit player known for his versatility.Over the course of his career, he played every position other than catcher and 1B. As a member of the Mets in 2001, he actually pitched an inning, throwing over 90 mph. While his versatility couldn’t be questioned, his bat could be. That’s why he played for 7 teams in a 12 year career. 1998 started off as a great year, and he was flirting with .300 by early July. Then he began the first of two remarkable slumps that year. In July, he hit a stretch where he hit 1-42 (.024). Then in late August-early September he hit his 0-36 skid. A couple of years ago, he wrote a really interesting piece for Bleacher Report about his exit from baseball, and the feelings of despair he felt when his career was over. 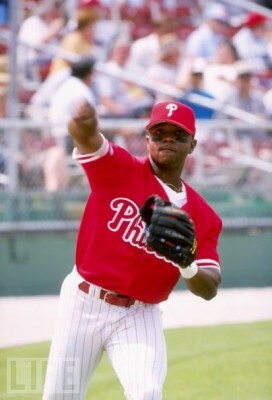 UPDATE: Just saw that Relaford wrote a piece on NBCPhiladelphia today about Raul’s slump. Very cool.